In 2008, China was devastated by an 8.0-magnitude earthquake causing an estimated 87,000 casualties. One trillion yuan (about $146 billion) was given for rebuilding, but some claim the money was used for luxury goods. The Sichuan Earthquake, otherwise known as the Wenchuan Earthquake due to its epicenter, absolutely ravaged mainland China. The quake measured in at an 8.0 magnitude and is regarded as the nineteenth deadliest in history, taking the lives of at least 87,000 people, leaving 18,000 missing, more than 374,000 injured and millions homeless. To put that into perspective, the 1906 San Fransisco earthquake was a 7.8 magnitude, but only took the lives of an estimated 700 people. In November of 2008, only a few months after the earthquake, the central Chinese government announced it would spend 1 trillion yuan ($146 billion U.S.) to help with the rebuild and rescue efforts. After investigating China's National Audit Office, it was found that there have been close to 2,000 complaints of corrupt behavior with some local city officials exaggerating the death tolls in their counties in order to gain a larger portion of the relief aid. The tourism bureau and transport department of Chongzhou City filed their paperwork twice allowing them to snag 1.23 billion yuan ($180 million U.S.) of additional aid. A small portion of the 1 trillion yuan was supposedly sent to Beichuan, to be handled by the Beichuan local government, and now news reports are coming to light stating that the central Chinese city of Beichuan has also been involved in scandolous uses of the relief aid. Beichuan County has roughly 160,156 people occupying its borders and only 20,000 living in the town itself. The city became well known after 80% of the city's buildings were severely damaged or collapsed and for being the location of the Beichuan High School where more than 1,000 students were killed after two of the school's main buildings collapsed. Questions have been raised recently about local officials receiving large bonuses and acquiring luxury vehicles in the last couple of months and upon an official investigation probing the Mianyang Purchasing Network, the company that handles the local governments large purchases, certain documents have briefly surfaced. We say briefly because just as soon as they surfaced they were apparently deleted from Mianyang's official records, in hopes to never be seen again. Luckily, they weren't the only holders of these documents and they've finally been leaked to the media. The documents show that from the time the Beichuan government received the domestic support money, millions of yuan had been spent on high-end luxury vehicles. "Beichuan's go-vern-ment purchased one Toyota Land Cruiser, the most expensive V8 configuration, price 1.1 million RMB (or $160,653 U.S.) - the lowest version is only 700,000+ RMB, but a six cylinder is not impressive. I discovered a wide variety of brands and models amongst the disaster area purchased vehicle, but with almost every model, relatively higher-end versions wer chose. For example, a Toyota Prado was purchased with a navigation system. The earthquake must have ruined the disaster area's geography so much that the leaders no longer remember the roads." In fact, the vehicle spending tally is apparently 5,541,959 yuan or $744,887 (U.S.). The amount of money spent on the luxury goods pales in comparison to the total relief of 1 trillion yuan ($146 billion U.S.) and while most of the vehicles listed are not what we'd consider luxurious in the U.S., the Chinese considered them to be excessive purchases made by taking advantage of a very loosely-tracked central government relief fund. 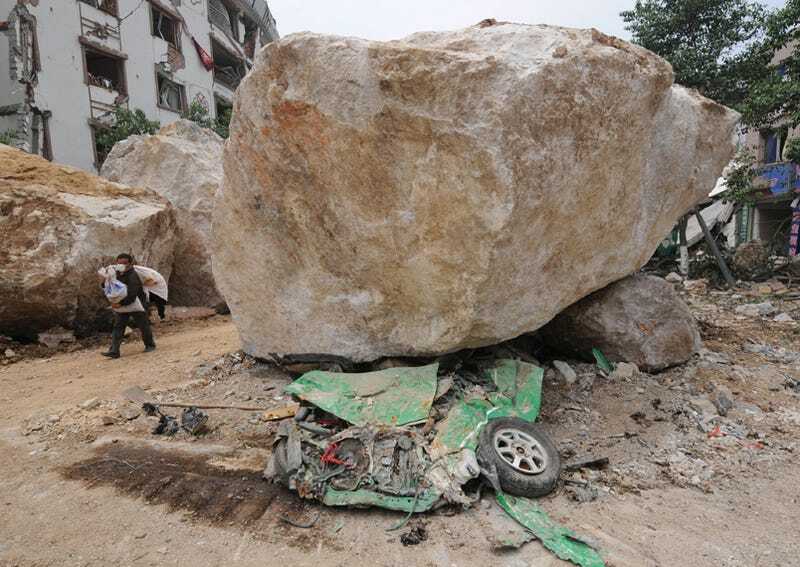 We understand that many of the Beichuan government's vehicles were likely destroyed in the earthquake, though the majority of the new vehicles were purchased with additional unnecessary options or were simply the more expensive upmarket version of that particular model. It saddens us to hear of this and we would certainly hope that something like this would never happen within our own borders. Yeah... right.